News in from Randall Greenfield at Ardell in Fort Lauderdale that he's signed a central agency for sale of Inace's 28.7m motor yacht Pier Pressure. Delivered in 1990, this superyacht has had numerous upgrades over the years including having zero speed stabilisers fitted and new Caterpillar engines installed in October 2009. 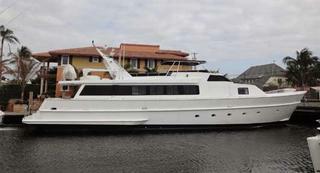 Sleeping six guests in a master, VIP and twin cabins, Pier Pressure is located in Fort Lauderdale and is asking $575,000.